Hugs are probably the most expressive way of physical communiaction with a person. 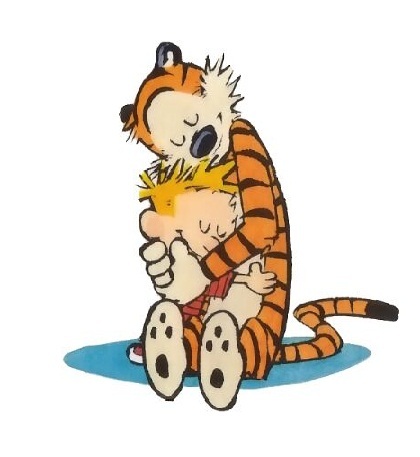 There are hugs for all times and for all occassions, be it happy or sad. Also, the kind of hug you get from different people varies. Hell! The kind of hug you get from the same person also varies under different situations. So technically there is at least one huggable person for every situation. Now, what actually got me started on this topic?? I wish some of my very close friends were here, not that I would have been able to hug all of them, but atleast their presence would not make me feel so lonely. You see, with some people that kind of a physical comfort never comes, even after years of sharing a beautiful relationship. In fact, if I were to, say hug Kiddo, both he and I would feel awkward about it. And that feeling of awkwardness would continue over meetings till the dam would break on either of the sides and we would tell the other person “Dont ever make the mistake of hugging me again. Its petrifying. It just doesnt feel natural or normal. :-/” Again, there is Mirchi and Prudence, and Jerry too off-course, whom I can ask for a hug whenever I want and am sure to get it if they are around. The other day, Prudence and I were talking about days like today when we feel like a real hug and a virtual one just wont do. We were wondering if we could make a robotic machine with 2 arms that could replicate the type of a hug we get from a person, if it could in any way generate the same warmth or feeling. I think that would do for a start even if it cannot give different hugs in different situation. Wouldnt it be wonderful if I could just choose whom I want to hug and get one instantly? Pointers anyone?